This is what greets you when you go through the gate and enter the back garden at Zanthan Gardens. 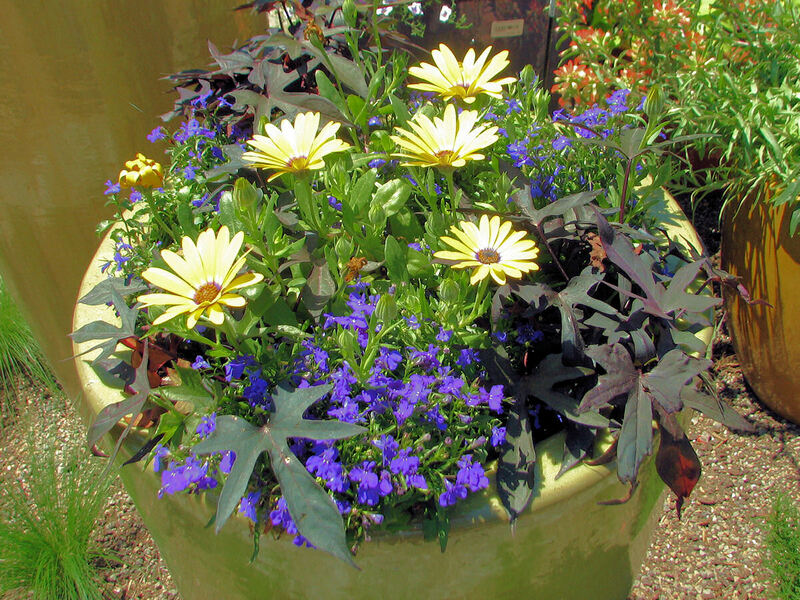 Zanthan is a true cottage garden, mingling flowers and vegetables wherever they grow best. Starting on the left, you can see larkspur, Swiss chard, and bluebonnets. Bluebonnets are not as tall as I imagined. I knew they were in the same genus as the lupines I’ve grown in my garden, and I just assumed, without reason, that they would be the same height. They’re shorter. As a matter of fact, when I look at them out of the corner of my eye, they “read” as grape hyacinths. Now, they’re bigger than grape hyacinths; I just mean they give a similar impression. 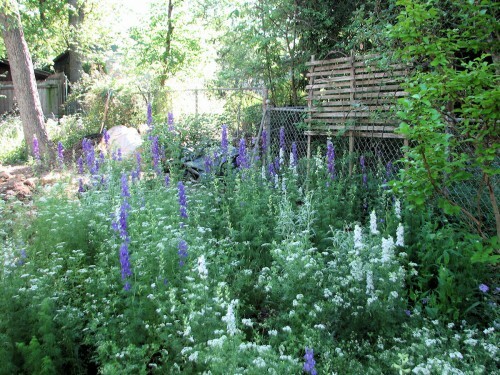 Yes, larkspur is a spring annual in Texas. I saw it everywhere as we were driving around. It is used in public places (median strips in gas stations, etc.) a lot more than it is up north, where it blooms in the summer. I was wondering why, and the best hypothesis I could come up with is in the North there’s too many perennials blooming at the same time, competing for the same planting spots. 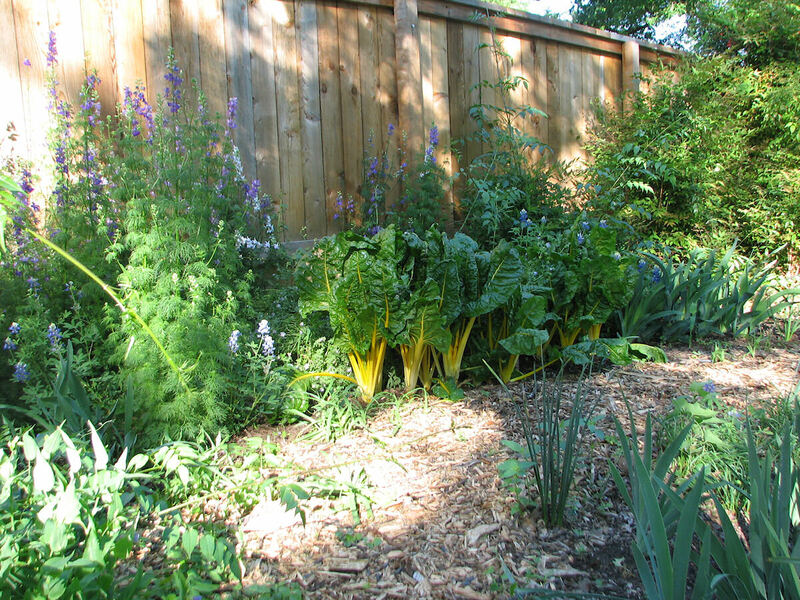 And you don’t have to replant daylilies and ornamental grasses every year, so that’s what Northerners plant for their low maintenance median strips. 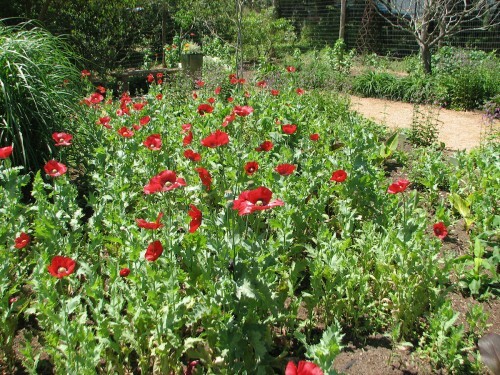 There were two large patches of these poppies on the premises of Natural Gardener nursery. Not sure if they are breadseed poppies or opium poppies. 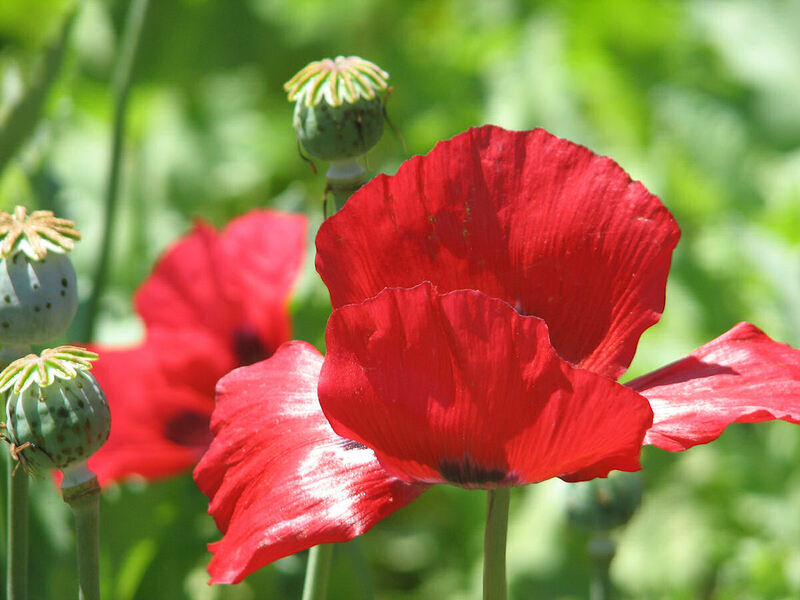 These are the same poppies whose seeds are sold on eBay. It wouldn’t surprise me if Natural Gardener harvested seed to sell from these big patches. I just love a business with a sense of humor. This threat is enough to strike fear in the heart of an inattentive parent. I love benches made out of natural materials, especially for wilder areas of the garden. I would love a bench like this along the path in the woods–if the stones just happened to be nearby. Hauling them there would be a nightmare. I appreciate the quirky humor of this bench, though it’s probably not very comfortable, and should really be considered garden art. 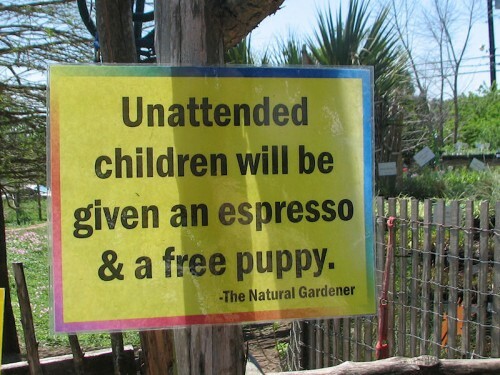 Also at the Natural Gardener. 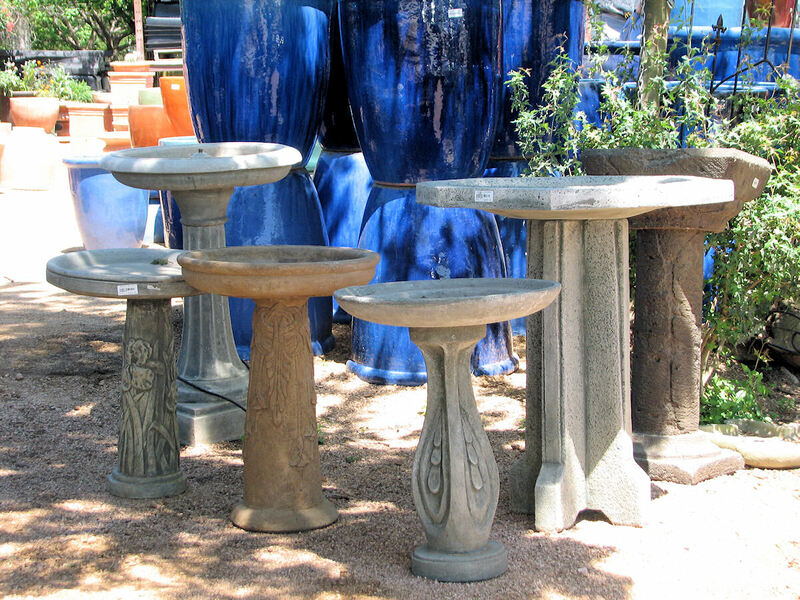 And here’s a selection of birdbaths. 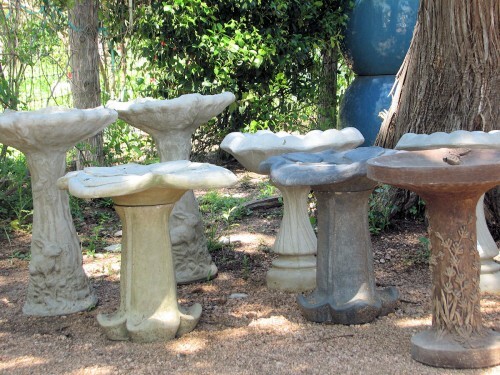 I decided I have a thing for birdbaths. 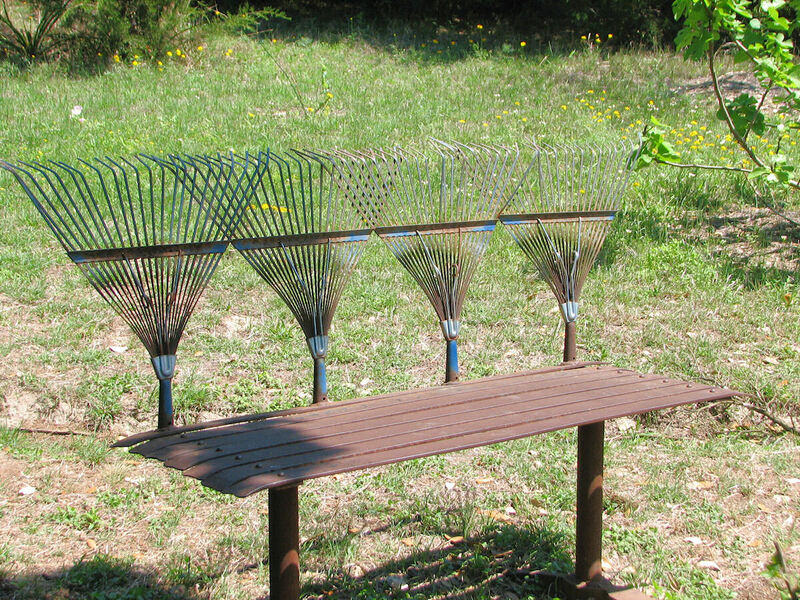 Garden art that serves a purpose beyond just looking pretty. I took several photos at Natural Gardener, because they had a good selection. I really like the one in the back, with the snowdrops on it. On to James David’s (pronounced “dah-VEED”) garden. Okay, so I am never going to have the moolah to install a stone stairway such as this: But, you know, I don’t think I’d ever want to. 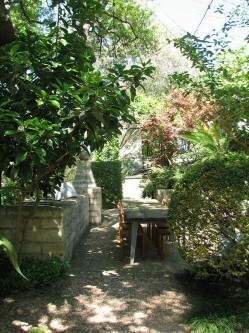 The garden at the front of the house was intimate, on a human scale, but the spaces in the back garden were too big. They felt institutional, public–meant for crowds. And the stairway led down to this: One thing this whole area taught me, was that in addition to feeling uncomfortable with heights, I don’t like edges, especially unguarded edges. If you follow the staircase on the left, it leads to the swimming pool. The only way to get to the other end of the swimming pool is to walk on the “edge” of it. I put edge in quotation marks because it is a paved walkway probably four feet wide, but there is nothing but water on the one side and a drop off on the other. (There is a good photo at Suburban Wildlife Garden, it’s the sixth one of the James David photos.) The drop is short enough that if my young, flexible kids deliberately jumped down, they wouldn’t get hurt. Their middle-aged, not so flexible mother might sprain an ankle, but almost certainly wouldn’t kill herself. On the other hand, I really like this dining area. It’s secluded, yet not too far from the house. I don’t think you can see them very well, but there are strings of small lights overhead, that would add a festive atmosphere for dining at night. And I imagine that in the Austin summertime, night is the best time to be outside. 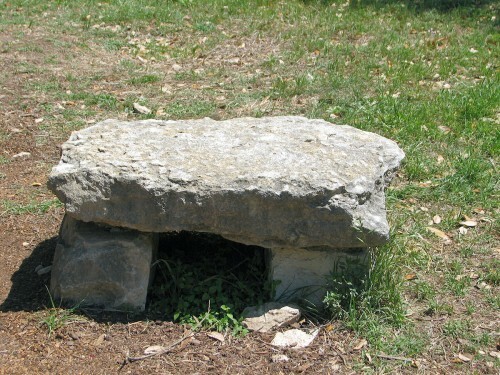 In the winter, the stone would yield the warmth from the sun and offer protection from the wind. I’ll bet this particular area is used almost year round. I’ve shown you my pictures from Spring Fling, but there’s more. 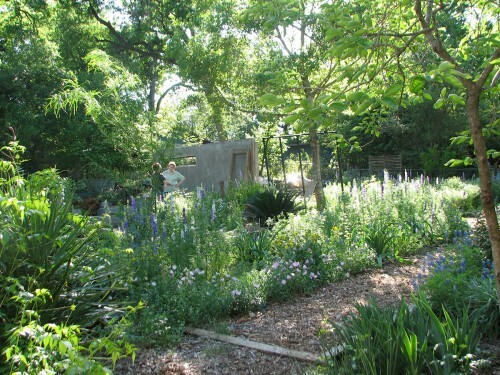 Along with a few others, I stayed an extra day and got to tour Lucinda Hutson’s garden. If I kept to my original resolution, I’d now continue with my visit to her garden. But this post is long enough, and her garden is worth a post of its own. If you haven’t already done so, I encourage you to visit the compilation of blog posts about this event. You’ll see more and better photos, and encounter different perspectives about the sites and sights that were part of this meet-up. I’m just starting to make the ‘Fling’ rounds. It looks and sounds like it was a really good time. Nothing beats a gaggle of gardeners in Spring. Visiting all the gardens just adds to the fun. Kathy, these are some great photos from the weekend. I’m very glad you got the “Children will be given espresso and a puppy” sign. I laughed out loud at that one! These are wonderful pictures of Texas gardens. Our daughter moved to Houston a couple of years ago and we were amazed at the different soils, the different flowering seasons, everything so different. We expected it, in a way, but when actually put in the position of making gardening suggestions we were at a loss. We bought her a book! My answer to any dilemma. Thanks! Nice to see what you saw on your spring fling. Pam over at Digging said there is a plan for next years fling in the fall if I remember right. Great series of pics! I thought the same thing when I saw Bluebonnets for the first time, earlier this month. Kathy, what gorgeous photos. I especially like the close-up of the red flower. Hi Kath – it’s fun to see what photos each person took and hear their impressions. I love your pictures of Zanthan Gardens and the way it felt to look across the meadows. I’ve been to the David garden twice and appreciated the opportunity to wander its paths and steps but it’s not my favorite. Maybe if I’d first seen it when I was in my thirties as Pam did there could have been more childlike delight, but I got here 20 years too late for that! I found it so taxing to constantly worry about footing that I missed many of the interesting plants and never even saw the Voodoo lily featured on other blogs. 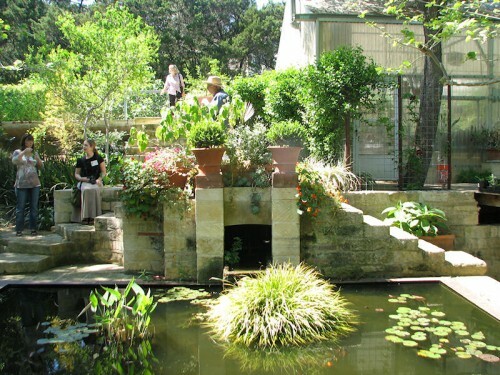 Back in 1999 when we were house-shopping for our move to Texas, our relocator took me to the Natural Gardener… it’s become a genuine Austin landmark. 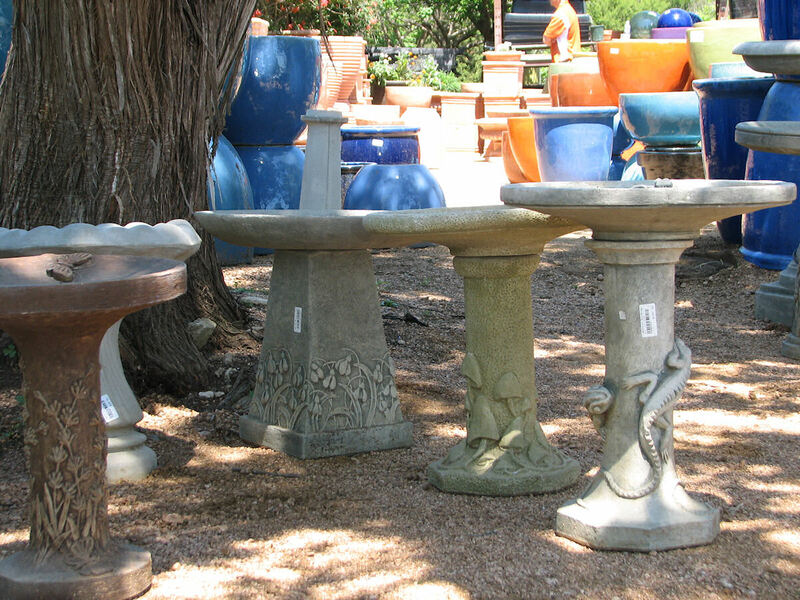 Your photos captured the wonderful poppies, the coveteble birdbaths, and the whimsy! Happy belated birthday! Did your kids make you a cake, Kathy? I am loving your posts, unfortunately I am on the opposite end of the scale when it comes to birdbaths. They kind of gross me out for no apparent reason. I mean I like them until they get placed in a yard and then I can’t stand them (which might explain why the one from the previous owners of our house is now holding the basketball hoop up). The whole ledge/water path thing is something I would think about if I had kids b/c they probably wouldn’t kill themselves, but the opportunity to be inconvenient enough to hurt someone is definitely present. It was a challenging area to get around, but I did notice that, as grand as it all was, James David knew and loved every inch of it. I wish I’d been able to walk more of it, but sitting let me notice things I wouldn’t have otherwise. I liked your thoughtful consideration of why the James David garden didn’t do it for you. And Dee and Bill echo your sentiments. However, I feel just the opposite. Although his garden is very large, each space feels human-scaled, even intimate. 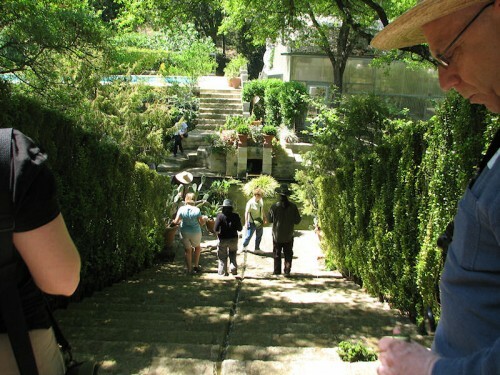 I have a childlike delight in stairways, narrow passages, twists and turns, and bridges—and this garden has them all in spades! It reminds me of the spirit, if not the aesthetic, of the Oriental Garden at Zilker Botanical Garden. My kids and I love to climb the steep moon bridge, traverse the stepping stones across the pond, climb the rugged staircases with insufficient handholds. For the kids it makes it fun. For me, yeah, it’s fun, but all those slightly dangerous paths make me slow down to appreciate what’s around me, to notice the beauty and the specific plants. David’s garden does the same thing. The more I think about the David garden the less I like about it. There were details about it that were interesting, but most of it was not anything that I would want for myself. I did like those great steps that led down from the house however. Great photos, Kathy, and nice to be able to tag along with you on this trip. 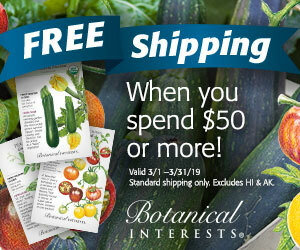 That sign cracks me up, and I’m glad that Austin IS so far from here and I can’t get to the Natural Gardener any time soon…or my grocery budget would all go to pots and plants. Carol, I was about to ask Kathy if that was you talking with MSS. I was happy to see these photos of MSS’ garden – it must have been wonderful to see the garden in person. 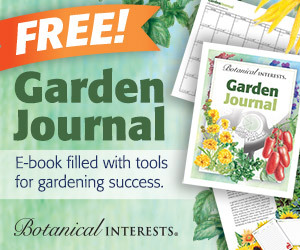 The Natural Gardener Nursery looks like an amazing place. Cool birdbaths. Kathy, I didn’t notice that sign. I wish I had. What great humor. I, too, like bird baths. I have two, but I’d like to have one more with a bubbler. Maybe next year.